During my college years at UW-Madison, I walked to class each day past a medical school building where a very strange thing was happening – human bodies were being dissected. What, I wondered, was that all about? Nearly forty years later, I have an answer, and it’s much more complex than I could have imagined. I’ve enjoyed a long career as a documentary filmmaker, but no film I’ve ever directed is as soulful or emotionally powerful as The First Patient. After years of development and research, the Mayo Clinic School of Medicine allowed the Duncan Entertainment Group the opportunity to follow first year medical students through the “Gross Anatomy” class. During seven weeks of filming this medical documentary at the Rochester, Minnesota campus, we followed a diverse and brilliant group of young people on a scientific, emotional and soulful journey of discovery. We knew we’d be breaking new ground as filmmakers, but the outcome is far more entertaining, educational, and thought provoking than we could have imagined at the start of class. That’s due, I believe, to the insights of the students that comprise the final narrative of the film. Their brilliance and diversity of thought is what makes The First Patient a “fantastic voyage” (yes, that’s a throwback to the feature film from 1966). The lab portion of the medical school class we documented took place on the 9th floor of a non-descript office building. Of the fifty-two students in the class, twenty-two agreed to participate in our interview process, and sixteen made the final cut of the film. 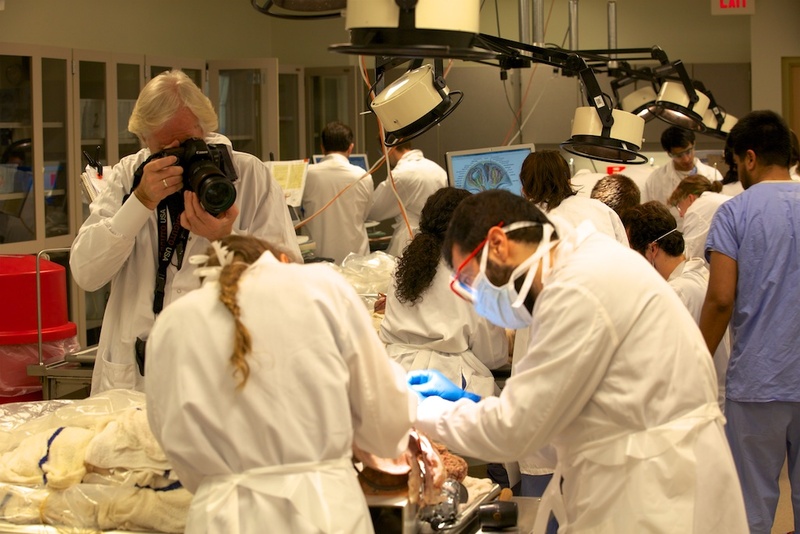 Of the approximately 250 bodies donated annually to Mayo Clinic for medical and educational use, 13 bodies were used in the gross anatomy class. Three professors and six teaching assistants participated on a daily basis with numerous medical specialists adding their insights for a day or two throughout the seven weeks. The First Patient is pure documentation in a classic journalistic style. It’s not historical, there’s no retrospective. Instead, it’s like newsgathering – it’s real life happening on camera with as little impact from the filmmakers as possible. Our crew showed up when the students showed up. We never moved a body, we never interrupted a student, TA or professor, and we never had a “do over” moment. What happened on screen is what happened in class – and the humor, compassion, pain and joy of discovery articulate the students’ journey. As the class began, we knew we’d witness a progression from fear to confidence. We imagined that we’d see the students learn what it means to become a doctor. What we didn’t expect is what happens in act three of the film as students answer the most important question of all: What are we? Their journey becomes our journey; their answers become our answers. It’s for that reason that we invite audiences to embrace their courage and overcome any judgments or objections they may have to watching the film. It’s my belief that you will not be disappointed. For more information about The First Patient please Contact Us.